ARCOS maintains an equipment library which provides a unique service for assessment and practise in using alternative technologies. The library makes the latest ‘high tech’ equipment available for free trial and rental, enabling clients to fully explore the capability and suitability of equipment before purchasing. The equipment library is a tremendous asset, allowing people to benefit from the most recent technology. It is generously funded via grants and donations, for which we are very grateful. Six saddle seated wheelchairs were purchased thanks to a generous donation from Allied Dunbar. ARCOS also stocks a variety of specialist equipment for eating and drinking which can be bought from the ARCOS Centre in Malvern. The saddle seated wheelchair was developed by ARCOS director Kay Coombes, and has been described as ‘revolutionary’, winning the International design award in 1994. The saddle seating system is therapeutic; promoting a comfortable, upright sitting position that provides a stable foundation for functional activities. People using a saddle-seated chair receive a great deal of helpful sensation from muscles, joints and skin. This is the feedback information we all need to feel safe and able to move without losing balance. It also encourages normal postural tone (essential tension in muscles). Because the body is supported, but not held in a fixed position, those using a saddle-seated chair have an opportunity to increase body control, be mobile and hence become more independent. In 2006, the wheelchair is being further developed, following motion analysis studies, as demonstrated in the photo alongside. The position of the pelvis is a key factor in sitting. 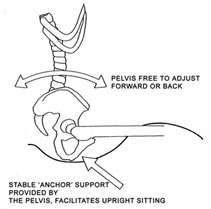 The saddle seat puts the pelvis in a position where it is both well supported and mobile. The firm, but comfortable seat, encourages the spine to extend. The upper body (trunk) is supported by flexible padded “wings”. The shaped table is integral to the design. The padded edge supports the users forearms and gives a secure and stable base for hand-eye activities, encouraging the trunk to come forward and promoting head control. The saddle-seated wheelchair is comfortable and therapeutic, helping the user to develop stability in their own body and to be as independent as possible. The stability provided by the chair promotes normal breathing, swallowing, voice production and communication. The posture facilitated by the wheelchair helps to prevent deformities caused by spasticity and inadequate seating. “It is an excellent chair and I would be happy to see this become a standard for chairs in the future” (Consultant Orthopaedic surgeon). ” We cannot put a price on the difference this chair has made on our daughter’s life and our lives” (Father of a client with cerebral palsy).